It's actually not in print anymore as the Church used to sell it at the Distribution Center. However, I've got the files you can download HERE. 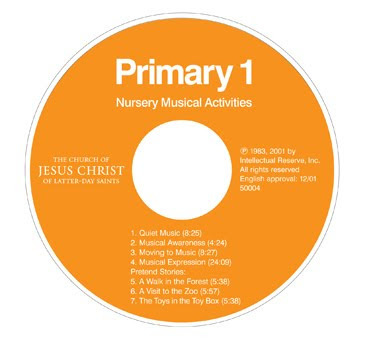 It's a great addition for getting more music in nursery (and even into the Sunbeam class!). The nursery leaders can even implement it with or without your help if they are looking for more ways to engage the children. It also may come in handy if you are in need of a substitute one week, or just a break! Some weeks when we are practicing in the chapel for an upcoming program and I can't do singing time in nursery, I'll use this. It may even be a cute (and very inexpensive) Christmas gift for the Nursery age kids! I'm also thinking those new Sunbeams in Primary starting in January may find this a fun introduction to Primary singing time as well! It lets you move and wiggle while listening to music. The possibilities are endless! Does anyone else own this CD and have any more ideas on how to use it? Leave a comment if you do! I cannot find this CD anywhere! Any suggestions on where else to find it? The link does not work. And I have thoroughly enjoyed your website. Thank you SO MUCH for all of the ideas. Maybe it's not in print anymore - I'll probably just remove this post. Sorry about that, I've LOVED this CD!